September was a whirlwind! It started in LBI, New Jersey, parked in a friend’s driveway. We stayed there for a few weeks so we could drive up to New York City for another day at Senior Planet. We left New Jersey and drove back home to Fort Lauderdale, Florida. Even though we only had about a week at home, we took advantage of some beautiful weather to do our favorite thing – kayak diving. Then, at the end of the month, we flew to San Francisco because Google invited Chris to a conference for Top Contributors. It was only 2 days, but we made a week out of it to do some sightseeing and some teaching at the Golden Gate Computer Society. See lots more photos on our September Photo Album. We also presented our “What Does This Button Do?” online class twice in September, once for Voice Dictation, and once more for Anti-Virus apps. October: Since we’re posting this late, we have already done an RV rally in Bradenton, Florida – Living the RV Dream. Check out episode 97 of our weekly show where we interviewed John and Kathy Huggins of Living the RV Dream who organized the rally, and Eric and Tami Johnson of TechnoRV who were fellow seminar presenters. By the way, our pictures, Blogs, Web Albums, maps, and videos are all examples of what we teach. You can learn how to plan, preserve, and share your travels (or your life.) It makes the experience that much more enjoyable to get creative and share pictures, maps, stories, and movies with friends and family. Check out our Learning Library of Tutorial Videos, just go toGeeksOnTour.com and click the menu for Tutorial Videos. There are plenty of free videos in addition to our members only content to whet your appetite for learning. We’re in Florida until February working on the website and The Button Show. Each week on our What Does This Button Do show, we cover a Beginner’s Lesson on a particular topic. There’s still some editing and formatting to be done before putting it on Amazon, but if you’re a member of Geeks on Tour, you can read it on our website now, or download the .pdf. Geeks go to Google … again! We often refer to ourselves as Google Evangelists. We enjoy so many of their products, but it is the photo-related products where we do a deep dive. In 2009, we specialized in teaching Picasa and Google invited us to a conference to speak about what users need in the way of support. 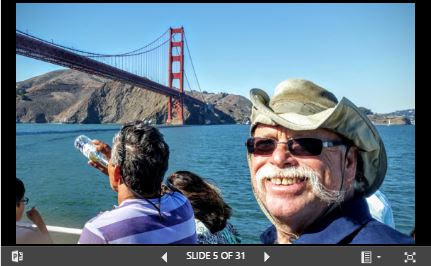 Now that Picasa is retired and Google’s new photo product is Google Photos, Chris has done what it takes to get noticed again and Google calls her a product expert and Top Contributor in the Google Photos forum. 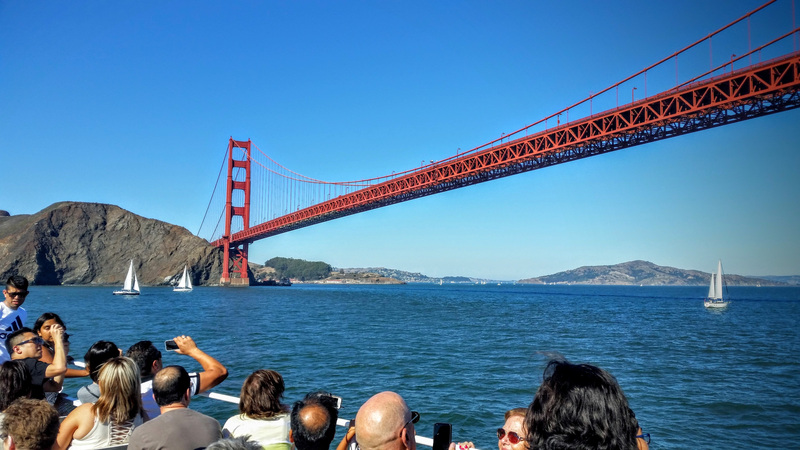 At the end of September, we flew out to San Francisco and made a week out of the 2 day Top Contributors conference. Read the article if you’d like to know more about the conference, and maybe how you too can become a Top Contributor! It’s not so easy any more, but it can be done! Using either Google Slides, or PowerPoint and OneDrive, you can create a custom slideshow for your photos and anything else you want to show. This article explains, and shows an example from both. Our definition of Technology for Travelers is using smartphones and computers to plan, preserve and share your travels. We use all free Google products for our pictures, maps and blogs. #94 Does your Mobile Device need Anti-Virus? #96 How Do I Keep My Battery Charged?